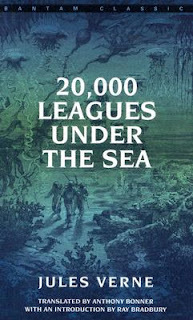 A Literary Odyssey: Book 100: Twenty Thousand Leagues Under the Sea by Jules Verne (Finished). 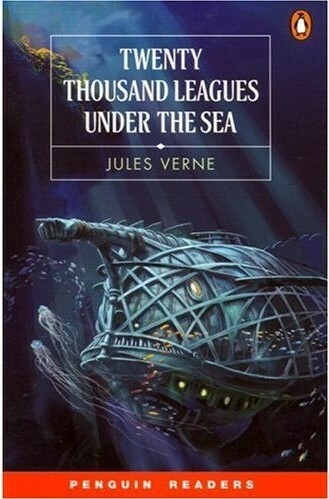 Book 100: Twenty Thousand Leagues Under the Sea by Jules Verne (Finished). "The sea is everything. It covers seven-tenths of the terrestrial globe. Its breath is pure and life-giving. It is an immense desert place where man is never lonely, for he senses the weaving of Creation on every hand. It is the physical embodiment of a supernatural existence... For the sea is itself nothing but love and emotion. It is the Living Infinite, as one of your poets has said. Nature manifests herself in it, with her three kingdoms: mineral, vegetable, and animal. The ocean is the vast reservoir of Nature." I am not as well-versed in older science-fiction as I ought to be. I mean, I declare a fierce love for modern science-fiction, so what makes me wary of the old stuff, the original? Perhaps I owe that impression to my first read of a Wells novel, The War of the Worlds, when I was back in college. I read it on a whim and hated it. It was boring, moved way too slowly for my liking, and wasn't as exciting as the more modern pieces I was used to reading. Verne is very different from Wells. Where Wells seems to promote the idea that too much progress is bad for society, Verne seems to encourage progress. More progress equals better things for humans. This is one of the things I continually ran across in my research, and now that I have finished Twenty Thousand Leagues Under the Sea, I agree. Verne does seem to promote progress and expansion. 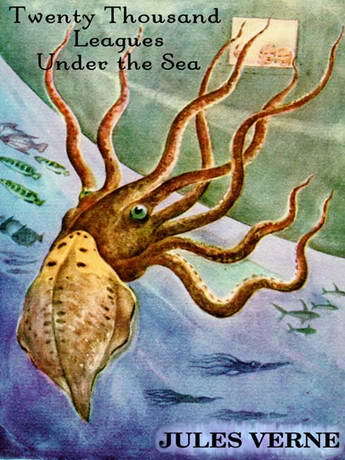 For anyone unfamiliar with the novel, Twenty Thousand Leagues Under the Sea opens with a small amount of mystery. There have been a few incidents in the ocean of a large sea creature. In a couple cases it was simply spotted, but in another, it significantly damaged a large ship. The world is in an uproar since a creature of this magnitude hasn't been seen before! An expedition is started in the United States, and the famous Professor Arronax joins last minute (he is an expert in sea life, etc). What the expedition soon finds out is that the creature is not a creature, but a large submarine, captained by Captain Nemo. Arronax and two others are captured and spend the next few months aboard the Nautilus exploring the oceans of the world. This novel is FASCINATING. For being published in 1870, the descriptions and ideas are remarkable. You can tell from the beginning that Verne had a great imagination and background to write this kind of tale. 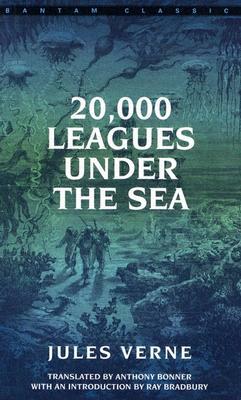 The descriptions of the ship, the technology, and the way of life aboard the ship shows the amount of research and planning Verne had to do before even attempting to write this. It makes the whole thing plausible, which really is the basis of any good science-fiction. As for the characters, I loved that Verne kept an aura of mystery around the figure of Nemo. We learn bits and pieces about this past throughout, but we are never given answers to everything. I bet this would be frustrating for many, but for me, it added to the excitement of the adventure. Arronax is a little annoying when he rambles on about the creatures (see above), but he is an honest narrator. As a scientist, he often presents the facts to the reader before giving his own emotional spin. I also really loved Ned Land, and felt for him dearly (you'll have to read it to see why). But overall, I was impressed with the scope of this novel. Again, for a novel published in 1870, I was amazed by the level of science and imagination. I think that this has stood the test of time and would truly capture anyone's imagination. When I searched for images to accompany my little review, I was floored by all the lovely images. Go do a Google search-so many wonderful covers! Walt Disney World used to have a ride based on the book. It closed in 1994. How amazing would it be to have a theme-park based solely on novels? Here is more information about the ride. 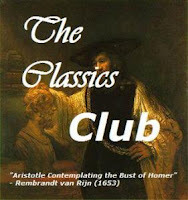 This is the first full novel I read on Homer, my NookColor. It was a great reading experience. I will say that my eyes tire faster reading on Homer-mainly because it is backlit (because of the color option). This is BOOK 100 off my list! Hurrah!! 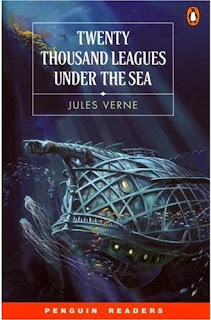 Jules Verne is one of my favorite authors - and I love this book! Did you know it's one of a trilogy? The next is In Search of the Castaways, and the final is The Mysterious Island (another personal favorite). Each deals with a different scientific area and they are just as good as 20,000 Leagues! Yay on 100!! And also - a literary theme park? I LOVE it! Great review. I'm actually re-reading this novel now. I read it when I was 10-12 or so and am happy to report that I am immensely enjoying it again. I always keep in mind that Verne's visions were decades before submarines were even thought of. I need to read this! I think I've read maybe the first chapter or so ages ago, and I don't know why I abandoned it. Congratulations on hitting 100 books! Your review has encouraged me to pick up this book (well access the e-book version again that is) again. I read till the professor and the two others were picked up by Captain Nemo's sub, but then got distracted by other books, assignments and my four-month-old. Great review! I've been wanting to read this book for years. Glad to hear that it's a good choice! I have never really considered reading this; although I do have it on the shelves. You've definitely sparked my interest though! I went on that Disney World ride!!!!! I have this one on my shelf along with several other Verne novels, and now that I've read your review, I can't WAIT to read the book. This will be good for me, too, since I'm teaching SF and Fantasy. I read Around the World in 80 Days last year and quite enjoyed it. Like you, I thought War of the Worlds was a huge snooze, so I'm not eager to read more H.G. 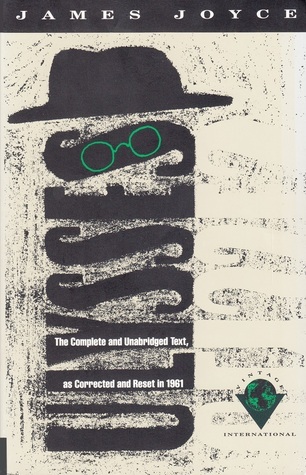 Wells, though The Invisible Man looks pretty intriguing. I have a copy 20K Leagues floating about the house, I shall have to take a closer look at it. I've really been enjoying Zola lately so I should look at some more French writers. Congratulations on your 100th classic book completed! Woo hoo for 100 books! I read this one earlier this year and didn't love it. I really thought the concept was fascinating and enjoyed it at first, but I felt like the details of the nautical life just took over the story and made it drag for me. I did love Nemo though and I agree, I preferred the mysterious nature of his character. I haven't read this one but it's on my tr list. Have you read "Around the World in Eighty Days"? I didn't think I would like it but in the end loved it. A great adventure story. I am not crazy about science fiction (the modern stuff) but I really enjoyed this one a lot. I listened to a professional (as opposed to free librivox) audio of this book and didn't find myself turned off by the flora and fauna descriptions at all. I guess because I knew I couldn't fast forward? I look forward to reading more Jules Verne.